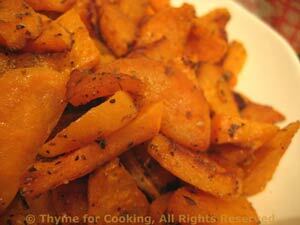 Fried Sweet Potatoes, Thyme for Cooking simple sides. Incredibly easy, faster than the more traditional sweet potato methods of baking or drenching in something sweet; simple frying lets the wonderful flavor shine. A bit of oil added to the butter helps prevent burning. Peeling the potatoes is optional but not necessary. Cut the potatoes: slice the long way, first in half, then in half again. Now slice (the short way) about 1/4 inch thick. Heat oil and butter in large nonstick skillet. Add potatoes and sauté until tender and a little crispy, stirring and flipping as needed. Sprinkle with thyme, salt, pepper and serve.